Mississippi Gov. Haley Barbour's term expires in 2011. WASHINGTON (CNN) - Mississippi Gov. 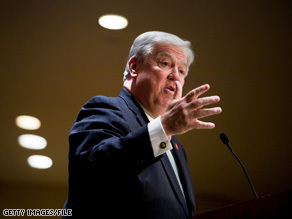 Haley Barbour has a busy week of political travel ahead of him, sparking chatter that he's collecting chits for 2012 presidential run. Barbour - a widely-respected figure among party insiders who will wrap up his second term, conveniently, in 2011 - is visiting a trio of important states this week, beginning on Monday in Virginia, where he's campaigning for Republican gubernatorial candidate Bob McDonnell. On Wednesday, he'll work his southern charm up north in Bedford, New Hampshire at a fundraising reception for the state GOP. And on Thursday, he's speaking at another state party fundraiser in the pivotal caucus state of Iowa. Matt Strawn, the chairman of the Republican Party of Iowa, said Barbour was invited to speak at their "Night of the Rising Stars" in Des Moines, in part, because Barbour knocked off a Democratic incumbent to claim the governorship in 2003. Iowa Republicans are trying hoping for a similar result against Democrat Chet Culver next year. "Haley has a message that will resonate with Iowa Republicans, capturing a governorship and providing competent and common sense conservative leadership," Strawn said. Barbour, a 61-year old native of Yazoo City, Mississippi, is a former lobbyist and Republican National Committee chairman who won the governorship in 2003 and was easily re-elected in 2007. Even with a Democratic legislature, he has governed as a strong fiscal and social conservative, although he did sign into law a cigarette tax increase in May. He won praise earlier this year from many conservatives for opposing millions in federal stimulus cash devoted to unemployment benefits, which he said would force states to raise taxes when the money runs out. That stance is shared by McDonnell, the man he is campaigning with in Virginia today. McDonnell spokesman Tucker Martin said Barbour can speak about his "great record" on job creation, energy development, and education reform - three pressing issues in the Virginia race. "So as Bob talks about how he will lead in Virginia, certainly Governor Barbour's model is one to look to," Martin said. Jared Leopold, a spokesman for McDonnell's Democratic rival Creigh Deeds, countered that Barbour is an "old-style" cheerleader for the policies of George W. Bush. Barbour helped raise $250,000 for McDonnell's campaign on Monday. The official line on Barbour's travel is that his trips are in his role as a prominent GOP leader and as the Vice Chairman of the Republican Governors Association. The Virginia's governor's mansion is the big political prize of 2009, and Iowa and New Hampshire both have gubernatorial races next year. But politicians - especially sitting governors - rarely end up in Iowa and New Hampshire by coincidence, and Barbour is considered one of savviest political minds in his party. He has already lent his voice to the National Council for a New America, a Republican effort help re-brand the national party. The group includes other possible candidates like Mitt Romney, Bobby Jindal and John Thune. According to one of Barbour's longtime political confidantes, a 2012 run could be in the cards. But the adviser noted that Barbour is also a political junkie: as a former party chairman, he enjoys meeting with state parties and new candidates around the country to talk about upcoming elections. "I think Haley is probably like a lot of other governors and senators who think, 'I could be that guy or gal who could lead the party,' and it may be that Haley is the person," said the confidante, who requested anonymity to speak freely about Barbour's ambitions. "But first-things-first. This year, and 2010, is first-things. Let's tend to those and then we'll see about 2012." I wouldn't vote for him. I don't like him as a potential president. Does he dip snuff or something or have gumballs in his cheeks?